But is this a complete assessment? In “An American Betrayal,” William Weidner’s in-depth feature in the April 2014 issue of World War II History Magazine, you’ll discover that the war’s political fallout was both unfortunate and complicated. Perhaps surprisingly, many Americans held the opinion that a Soviet sphere of influence in Eastern Europe after the war was not necessarily a bad thing. European countries had attacked Russia three times through the smaller states in Eastern Europe. And During World War II, the Germans caused great economic damage to the Soviet Union, and had killed more than 20 million Russians. Western Russia was devastated by the German occupation, and this gave the Soviet Union moral high ground in subsequent negotiations with Roosevelt and other Western Allies. As Weidner suggests, it’s easy to look back through history with the clarity of vision that hindsight provides and condemn President Roosevelt because he was not able to predict the unfortunate conditions that emerged along the Eastern Front. But short of war, which was unthinkable, it is difficult to see what Roosevelt could have done differently at the time. In Richard Beranty’s feature, “Flak Was Our Worst Enemy,” you’ll meet Wilbur “Bib” Bowers, a veteran bomber in the Eighth Air Force. In “Palermo Captured,” Kevin Hymel describes the scene inside what was at the time the largest enemy city to be captured by the Allies. In “Drive to the Don,” you’ll learn from Pat McTaggart how Soviet counterattacks blunted a German thrust toward the key city of Rostov and the River Don. In “Death of Himmler’s Henchman,” Richard Rule describes how Reinhard Heydrich, responsible for the murder of many, was himself assassinated in Prague in the spring of 1942. 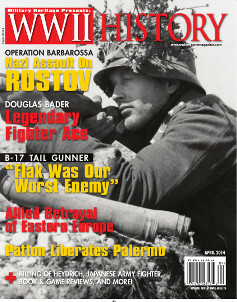 And of course, you’ll also get fascinating insights into the war from several trusted authors. The April issue opens with an editorial by Michael Haskew on Frank Lahey, a Boston doctor who predicted President Roosevelt’s death in office. Please let us know what you think about these and other stories in the April issue of the magazine in the comments below. Tags Allies, Eastern Front, Eighth Air Force, Europe, Franklin Roosevelt, German, Iron Curtain, Reinhard Heydrich, Soviet Union, The Eastern Front, Wilbur Bowers, World War I, WWI, WWII.